A former Manx Grand Prix competitor from Douglas is taking part in another two-wheeled challenge to raise money for the National Deaf Children's Society. 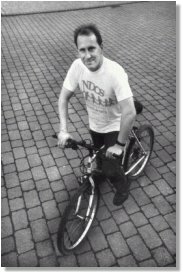 Despite horrific injuries suffered during a crash in practice for the 1979 MGP, Donald Russell, 46, hopes in October to cycle more than 300 miles across Cuba to raise £2,500 to support deaf children in the Island and in the UK. Donald, an engineer for the Manx Electric Railway, said: 'I saw an advert for the challenge in a newspaper at Christmas and thought it would be a great idea. 'After my accident in 1979 it took me two years to fully recover and I was left with a semi-artificial knee joint. 'Two years ago a friend of mine was really into cycling and I thought it would be a great way to get out and about despite my injury. 'Ever since I've frequently cycled as much as possible including cycling to work and last year I managed to cycle around the TT course with my 11-year-old son William. Donald trains mostly at weekends but admits he is daunted by the prospect of cycling an average of 75 miles a day under the hot Cuban sun. Donald said: 'This is a real personal and daunting challenge for me though I'm determined to succeed and raise as much money as I can for the NCDS. The journey begins in Hanabilla where Donald will join a group of adventurers from around the UK who will stay in the saddle for around seven hours each day until they reach their destination in Varadero several days later. Donald needs as much fundraising support as possible if he is to attempt the challenge and he is looking for donations of any sort.